Austin Area Market Statistics: September Number Are In! Single-family home sales in the Austin-Round Rock MSA decreased 4.3 percent year-over-year to 2,433 home sales in September 2017. Single-family home sales also declined in most of the counties in Central Texas, with the exception of Williamson County (up 1.0 percent year-over-year to 873 home sales). Home sales declined in Travis County (down 8.6 percent year-over-year to 1,146 home sales), Hays County (down 0.3 percent year-over-year to 299 home sales) and the city of Austin (down 4.1 percent year-over-year to 719 home sales). Home prices in the five-county MSA continued to rise at a steady pace in September. During the same time frame, the monthly housing inventory for single-family homes in the Austin-Rock MSA continued to rise for the ninth consecutive month increasing 0.3 months to 3.0 months. 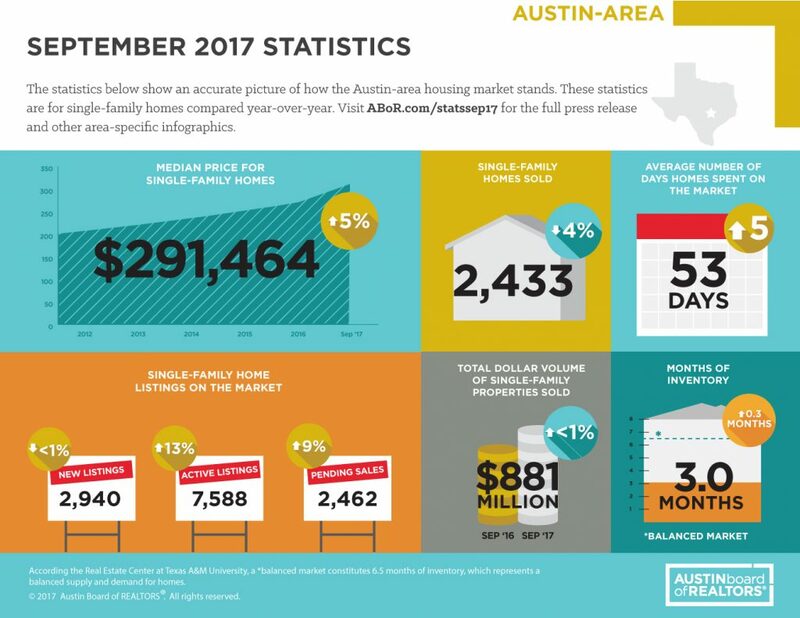 In the city of Austin, median price increase 4.0 percent to $355,000 in September, while monthly housing inventory remained unchanged at 2.4 months of inventory. The increase in housing inventory has led to a recent spike in new and active listings. Have questions about how the market conditions may affect you directly? Call us at 512-330-1004 or email office@papasanproperties.com. Pssst…Have you heard about our Keller Williams exclusive ZeroPLUS mortgage option?